Seven days have come and gone since I bought my Honda ST1300. I put 578 miles on it thus far. My friend Tom asked me today what I thought about it. "It feels like me", I said. I guess what I meant is that I feel like this bike better represents the person I am inside compared to the Harley-Davidson Ultra Classic. In 2004, I bought the Yamaha Road Star. But actually, I had wanted the Harley-Davidson Road King. At the time, I was enamored with the styling of classic American motorcycles. But there was a frugal side of me that said the Yamaha Road Star has similar stylings, costs much less, and gives you more power. Hence, the Road Star reflected the person I was. And I spent a good deal of money buying chrome pieces and accessories to cultivate that classic American look. The Harley-Davidson Ultra Classic, however, never really reflected how I felt inside. It was my wife who really liked it. She loved the feel of the back seat, and liked the lower foot position of the passenger floorboards. She also loved the spacious storage for all her things. So when she suggested I should buy an Ultra, how could I resist having a second motorcycle? And over time, I grew to love riding it, and for awhile it was the bike I rode all the time. But when I bought it, I vowed that I would not spend any money buying chrome, or anything cosmetic. I already spent too much money customizing the Road Star. Instead, I would only purchase accessories that had to do with performance or comfort. That vow changed my entire way of thinking. I now took on this philosophy that "chrome doesn't get you home". That is, you buy a motorcycle to ride, not to show off, or use as a chick-magnet, or enhance your personal appearance. Moreover, the Ultra is a touring motorcycle, made for taking long rides, overnighters, and road trips. And so I rode that motorcycle, and just rode it everywhere. I put 70,000 miles on it in 3 1/2 years, along with the 45,000 miles I put on the Road Star. My opinion progressed further to where I preached the concept that motorcycles should be ridden, and so let's take our bikes out and ride all day long. Let's ride through the canyons and over the mountains, and up and down twisties. Let's ride them hard and fast, and push them to their limits. I told people that scratches and dings are badges of honor, and that if your bike is shiny and clean then you've only wasted time. My philosophy changed from wanting a cool-looking Americanesque cruiser, to wanting to ride roads at a comprehensive level. Therefore I demanded a motorcycle to match. When I bought the Road Star in 2004, I never thought I'd end up with a sport tourer in 2010. If you own a Harley right now, can you be certain of what bike you'll be purchasing in five years? Well put. That's a sweet ride. In 5 years? Maybe a brand-new shiny Harlectric 103 Cubic Kilowatt? In 1996 I bought a ’96 Yamaha Royal Star to replace my ’83 Honda CX650C. It was used primarily for long distance. 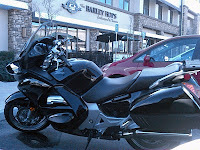 At that time I didn’t feel that Harley had anything I could do 1000 miles a day consistently without issues. Not that I had anything against Harleys, I owned two at the time, (still have them), an Ironhead and Shovelhead. Not what I consider trouble free for touring. The Honda and Yamaha were pretty much turn-key the whole time I owned them. I replaced the Royal Star in 2007 with a new Heritage. The 96B and 6-speed has so far been fine. As for the future? I’ve got no idea. I still think the Goldwing is the best thing out there for cross-country. Great post! I'm 62 and late last year, sold my CBR1100xx Blackbird and bought a Street Triple. If you're interested in a comparison and the reasons why I felt the need to change: http://geoffjames.blogspot.com/2010/01/street-triple-vs-blackbird-some.html. I think people should ride what they please and can afford, regardless of what anyone else rides or thinks. Personally, I'm a cruiser guy, and I admit to a love for Milwaukee iron. No matter how cool, capable or turn-key a motorcycle may be, if it looks like an Escape Pod from the Starship Enterprise, it's just not for me. I almost bought a Road Star or V Star (can't remember which but it very much looked like a Heritage), off a guy I used to work with for 10 grand. I just couldn't scrape up that much, so I bought my 1200 Sporty for 7 instead. Then after I got my settlement money from being hit on that bike, I bought my Springer, and I really love it. The 96B and 6 speed have not missed a beat or leaked a drop of oil so far. I love the retro look, the way she feels on the road, and of course, the you-only-get-it-with-a-Harley sound. In 5 years I see myself possibly going to a touring model, though I really don't care for fairings. But I'll be 50 then and I'm sure that function will have overtaken form by then, and I'll be wanting more comfort, more protection from the wind and rain, and more room for gear. I'm pretty sure that either I'll die on a Harley-Davidson, or the latest one I had before death will be sitting in the funeral home right next to me in the casket. Hell, it may even be a trike. But that's just me. Enjoy your new bike Steve. It's cool looking, and if it's you, then that's all you need to say. I too had a Yamaha Road Star, but it spluttered to a bad end right within 4 years of its buying date (2005 precisely). I think it's best to stick to Harley Davidson, especially for avid bikers like me. What say you?